Another affordable tablet with latest upgrade to Android 4.0 - Ice Cream Sandwich, A10 Core processor, 1GB DDR3 memory, multi-point capacitive touch screen. The built-in Google Android 4.0 Ice Cream Sandwich operating system not only inherits many advantages of the 3.x system, but bears many improvements such as the layout having a more intuitive design, a richer user experience, and smoother transitions within the OS. With new improved capabilities include folder options, multitasking and widgets. What’s nice with Aurora is the full HD screen resolution, it renders crisp color on any apps you run on this tablet. Viewing angles is also a bonus as it comes with IPS display, even if you’re under the sun or in the area where there’s a direct bright light you can still manage to browse on your tablet. 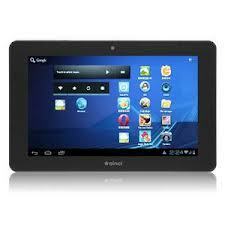 Its dual core processor can goes a long way for those who uses tablet in light gaming and other personal task. For storage Nova 7 Aurora has 8GB internal storage aside from microSD support that could take up to 32GB using the expansion slot. The RAM also is not a problem for this tablet it has a pre-installed 1 GB RAM capacity. Another good features for this tablet the USB OTG, you can enjoy using any external USB device with this device. We’re not sure if OTG cable s including in the package but in it is not bundled you can go visit your nearest mobile accessories store and get one, it cost only few bucks. Yo may take a look the few specifications of Ainol Novo 7 Aurora for your reference in case you're interested on this tablet. You may also read this post about Ainol Novo Service Center Philippines and Ainol Novo 7 Tornados Android 4.0 Tablet PC.